Potentially the most important, and most menacing meal of the day. If you’re anything like me, you’re mornings are CHAOTIC—feed the dogs, wake up my daughter, get dressed (a shower is a luxury), wake up my daughter AGAIN, walk the dogs, forcibly eject daughter from bed and into school clothes, find keys + purse, attempt to feed teenager and fail miserably… You get the picture. And it’s not always pretty. So I am constantly on the hunt for quick (read: premade), nutritious breakfast options that will not only fill my daughter’s stomach, but keep her going for the morning. And truthfully, I got tired of feeding her endless, foil-wrapped bars from the grocery store. I wanted to make something myself, to control the ingredients but also because cooking is one of the ways I show my affection. 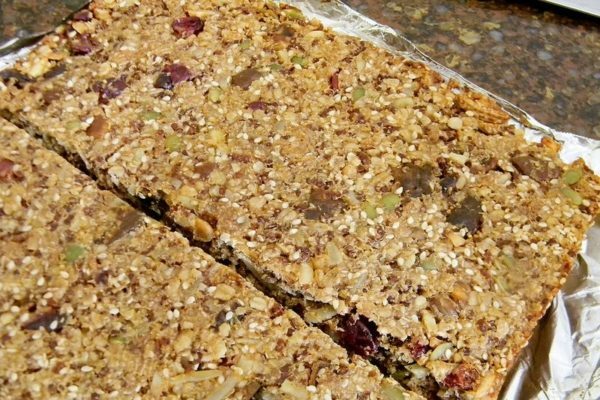 Enter the Healthy, Plant-Based Protein Bar Recipe. I love this delicious, DIY Healthy Protein Bar. It's perfect for breakfast, or as an any-time snack that you can eat on the go. The ingredients in this bar is designed to give you optimum, balanced nutrition – Protein, fiber, carbohydrates all in harmony to bring you a delicious breakfast option! It's a great option for kids and teens too! Put oats, raw almonds, sunflower seeds, protein powder, chia seeds and coconut in a bowl. Sophie Uliano is a New York Times bestselling author, TV host and wellness advocate! She strives to be a voice of reason in the wellness world, #MoreSmoothies #LessWooWoo. Visit SophieUliano.com to check out Sophie’s DIYs, recipes, reviews and articles!